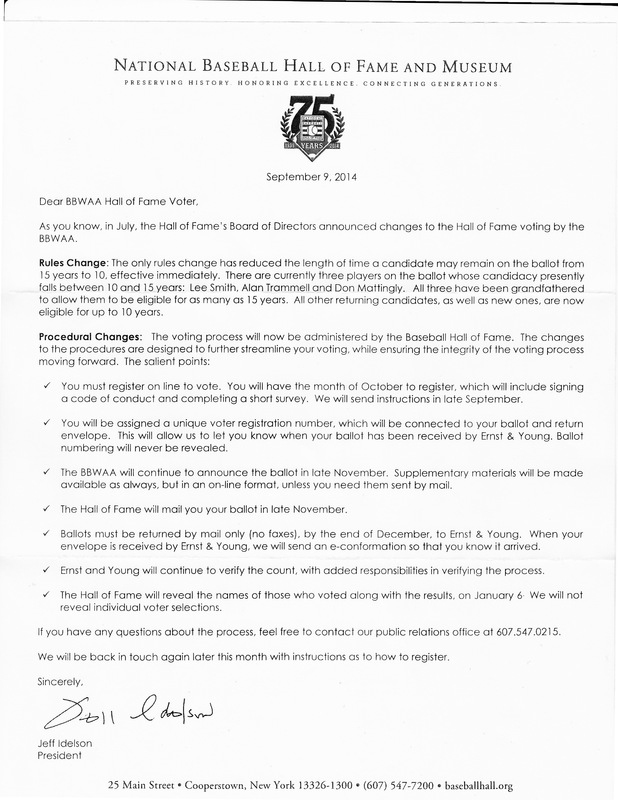 A year ago, the Baseball Hall of Fame instituted changes to its voting rules, the most important of which reduced an eligible player’s time on the ballot from 15 to 10 years. 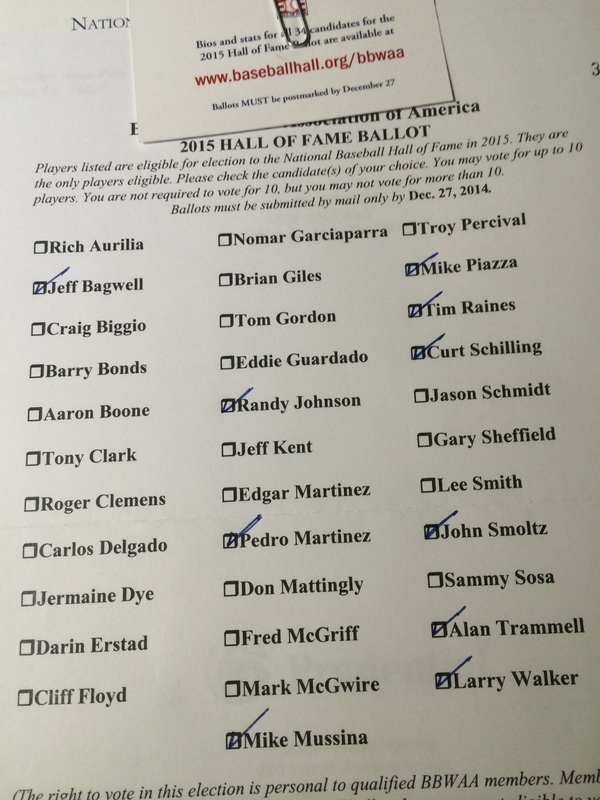 The Hall also moved to take control of the voting process from the Baseball Writers Association of America after Dan Le Betard of the Miami Herald gave his vote away to an internet site (Deadspin.com) to protest the Hall’s exclusion of known steroid users. Administration of the voting process was moved from the BBWAA to the accounting firm Ernst & Young, and voters were required to sign a code of conduct promising, among other things, not to give their votes away to ineligible voters. This year, the Hall has instituted another change, which it disclosed to voters in the August letter reproduced above. This change addresses complaints about the lifetime voting rights granted those who were active members of the BBWAA for 10 years or more. 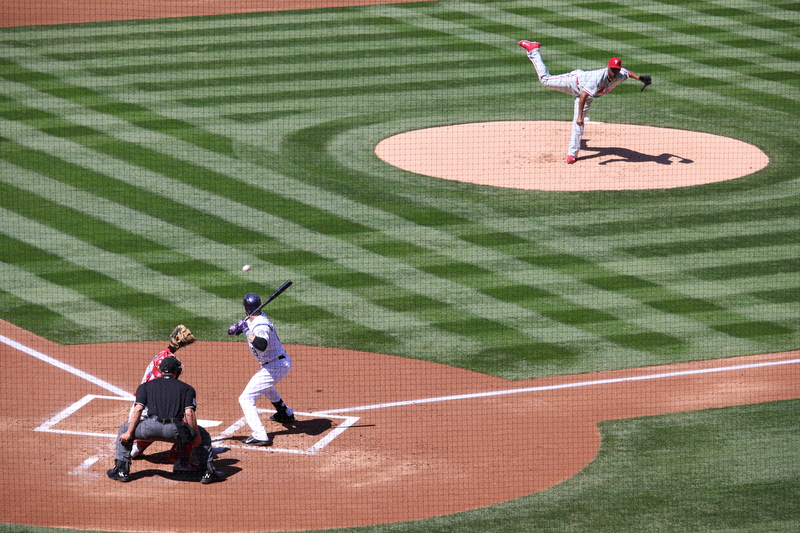 Critics of this practice have argued it is principally these old fogies, out of touch with modern baseball and overly moralistic about the use of performance-enhancing drugs, who have kept stars of the steroid era such as Barry Bonds and Roger Clemens out of the Hall. 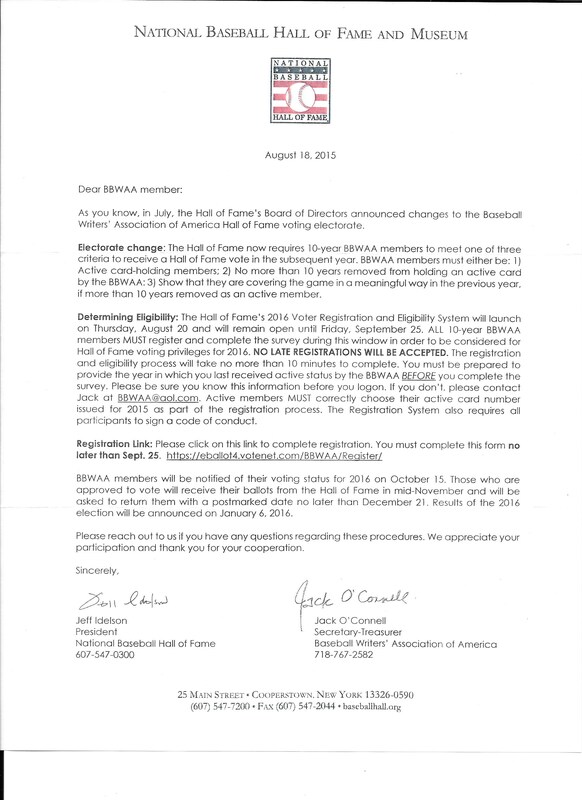 In response, the Hall has established a 10-year term limit on veteran members of the BBWAA once their membership ceases to be “active.” Being an “active” member of the BBWAA is somewhat arbitrary — when I moved from the Denver Post to KOA radio in 2012, I ceased to be an “active” member, even though I covered the Rockies with about the same frequency I had covered them as a columnist for the Post. 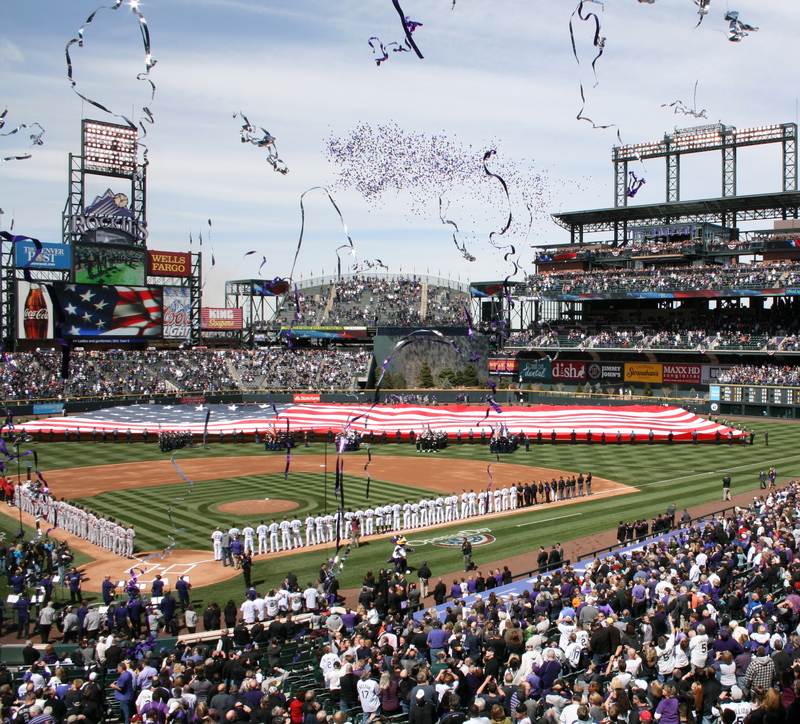 But the hybrid roles of the modern media — I wrote about the Rockies and baseball on this blog while at KOA — did not exist when the rules restricting eligibility to accredited newspapers were instituted. What this means in practice is that, barring yet another quirky change in my quirky career path, my last year as a Hall of Fame voter will be 2020, for the Hall of Fame class of 2021. It’s a wonderful privilege which I feel extremely fortunate to have had. I wrote something like 9,000 words (here and here) explaining my votes last year. Oddly, now that I no longer cover the Rockies, I see a wider array of teams with more frequency than I used to, thanks to DirecTV. Nevertheless, I support this change in the rules. The lifetime voting privilege has produced an arrogance in some voters that prompted the criticism that prompted the change. The process is still not transparent enough. I’d like to see all ballots made public so that voters can be held accountable for their votes. If you send in a blank ballot, thereby making it more difficult for all candidates to achieve the necessary 75 percent threshold, you should have to explain why you think no eligible candidate is deserving. As of now, making a ballot public is at the voter’s discretion, so those who take the process seriously tend to do it and those with their own agendas tend not to. In any case, the new procedures require each voter who is no longer an active member of the BBWAA to be re-certified each year as an eligible voter. The only way to be certified if your active membership ended more than 10 years ago is to demonstrate that you covered “the game in a meaningful way in the previous year.” In my current incarnation as editorial page editor of the Boulder (Colorado) Daily Camera, I no longer cover the game in either a meaningful or meaningless way. I did manage to get Jacob deGrom into an editorial on a recent Republican presidential debate, but, alas, that probably doesn’t qualify. So, if my math is correct, assuming I continue to be re-certified on an annual basis, I will be able to vote for another six years, having last been an active member of the BBWAA as a columnist for the Denver Post in 2011. I am enormously grateful to the Hall and to the BBWAA for this privilege and I will continue to make my votes public and explain them here for as long as I am able. Ballots for the class of 2016 will be sent out in the next week or two and must be returned (by snail mail!) no later than Dec. 21. Here’s a look at this year’s eligible players, courtesy of Baseball Reference.